I have especially enjoyed two recent articles in the New Statesman and want to share my enjoyment with Ephems readers. It’s invidious of course to pick out two articles from among so many good things that we can read every day with profit and pleasure in the exceptionally rich cornucopia of current British political journalism: one could easily spend all one’s waking hours relishing the goodies in the Guardian, the FT, the Spectator, the LRB, Prospect and the Indie as well as the New Statesman (and that’s an incomplete list anyway). So with apologies to all the equally stimulating stuff that I’m ignoring, here are my two special recommendations, both available online. By the time he stands down, David Cameron’s Britain will be neo-Georgian – a country that is, in effect, governed by a coterie of wealthy families competing for power. The obstacle does not lie in the political system, given that (aside from some restive Tories) the government has no effective opposition. In a performance reminiscent of Peter Sellers’s Chauncey Gardiner in the film Being There, the Labour leader has emerged from the walled garden of the hard left to wander around the country, dispensing gnomic observations about peace and kindness. It’s a surreal kind of theatre rather than a new type of politics. There is no risk to Cameron here. This is unfair to Mr Corbyn, but it does capture something of his strange personality, by no means unattractive but strikingly unusual in a major party’s leader. And it’s lovely writing. Mulgan obtained a First Class degree from Balliol College, Oxford and a Ph.D. in telecommunications from the University of Westminster. He was also a Fellow at the Massachusetts Institute of Technology, trained as a Buddhist monk in Sri Lanka and worked for a spell during the 1980s as a van driver for the “Labour-supporting collective of musicians and comedians known as Red Wedge“, opting ultimately for a career in local government and academia in the UK and going on to become an influential writer on social and political issues in various newspapers and magazines in the 1990s including the Independent, Financial Times, Guardian, New Statesman and Marxism Today. He worked as a reporter for BBC television and radio and was made a CBE in 2005. He has written a number of books including: Communication and Control:networks and the new economies of communication (1991), Politics in an Anti-Political Age (1994), Connexity (1997), Good and Bad Power: the Ideals and Betrayals of Government (Penguin 2006) and The Art of Public Strategy (2009). His most recent book is The Locust and the Bee (Princeton 2013) that has been translated into languages including Chinese, Russian and Arabic. He has written numerous reports and pamphlets for Demos, the Young Foundation and Nesta. He has lectured and advised governments around the world on policy and strategy – including China, Australia, the United States, Japan and Russia, and is seen as one of the pioneers of the global field of social innovation. He is profiled in two books – The New Alchemists (1999 by Charles Handy) and Visionaries (2001 by Jay Walljasper). He is chair of the Studio Schools Trust; co-chair of the London LEP Digital,Science, Technology and Arts group; a board member of Big Society Capital, and has been a trustee of the Design Council, the Work Foundation, Crime Concern, Involve and Political Quarterly, and a member of various commissions for bodies including the European Commission and the Academy of Medical Science. He has done TED talks on the global economy, education and happiness. 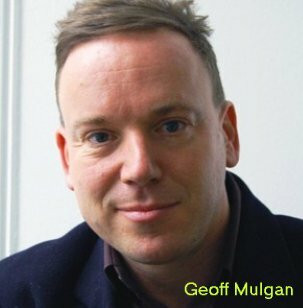 In 2007-2008 Geoff Mulgan was an Adelaide Thinker in Residence advising South Australian Premier Mike Rann on social innovation and social inclusion policies.As a result of Mulgan’s recommendations the Rann Government established The Australian Centre for Social Innovation. I was a teenage Corbynite and grew up to be an employee of Ken Livingstone and John McDonnell, as well as Tony Blair and Gordon Brown. Because of this chequered past, I have seen, up close, their virtues and their vices. The GLC was lively but also chronically factional. I worked for a time in John McDonnell’s staff and saw at close quarters his cleverness and his keen interest in power, which led him to take on the unglamorous but strategic finance committee. Before long, he attempted a putsch against Livingstone, whom he seemed to think of as rather wayward and indulgent, and there was always some plot under way. Comparing that with Mr McDonnell’s present situation prompts some interesting speculations. How lucky we are to live in an age when we can read so much of the output of dozens of newspapers and journals online, free of charge, without having to buy an armful of papers and magazines from the nearest newsagent that stocks them! Of course there are casualties of this enormous change but for most of us, so far at least, there are only benefits. The FT, our overall best national daily newspaper, does hide its online content behind a paywall, but a subscription to the online material is remarkably cheap and terrific value. No, I don’t have shares in any of these wonderful organs.